New bar and restaurant opening hours are in operation. 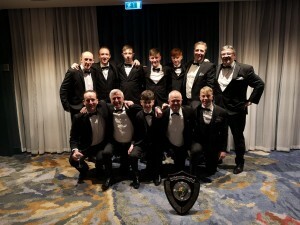 On Friday the 1st of February 2019, the GUI hosted their Annual Dinner to honour Club and Inter-Provincial Champions at Carton House in Meath. Kinsale GC was strongly represented thanks to the historic success of the All Ireland winning Jimmy Bruen Team. Also in attendance were Cathal Butler, a member of victorious Munster Inter Provincial Championship team and Eoghan Cassidy, a member of victorious Boys Under 14 Munster Inter Provincial team. Special mention was also made for the achievements of John Murphy in 2018. A huge thanks to all the players and the management teams for their achievements in 2018 and in helping to put Kinsale firmly in the national spotlight. This is only the beginning! Many congratulations to the 15 teams that have qualified for the final, which will be held on Saturday 23rd of March weather permitting. Overall the competition was extremely well supported and a great thanks to everyone who participated. We would like to thank the sponsors Roadstone for their continued support. Also many thanks to Brian Doran & Ian Stafford for administering the results tables in a very timely and efficient manner. Details of final day tee time and the draw will be made available closer to the day. As the year draws to an end, we look forward to 2019 and remember back to the wonderful year that was. The fixture lists have now been released for 2019 and we all start again. The defence of the Bruen Shield starts at Blarney GC on the 11th May, with a match against Skibbereen. The Barton Shield team will look to take their run a little further this year, commencing with a bye and playing the winners of Skibbereen and Mahon. This year the Barton Shield will be held at Kinsale, on the 13th an 14th of June. All the fixtures are at Team News. The Winter Leagues are taking a break for Christmas, and there is much to play for! The league tables and scores may be seen at Mens Tables and Ladies Tables. Thanks to the generous sponsors Douglas Lawn and Garden Care and Roadstone. It was a fantastic day, with incredible golf seen. The Amateurs won on the day, but the real winners were the deserving causes. With a little push the amount raised could break the €5,000 – and that would be an incredible achievement. On behalf of Ger, Ian, Cathal and John I would like to thank all those who donated, the sponsors, the caddies and spectators for making the Challenge such a massive success. Work on the course, as detailed in the development plan, continues as the weather permits. New bunkering on the 6th, 7th and 16th have made a terrific improvement, and will be well tested this coming season. The comprehensive improvement plan has been submitted by Ken Kearney Golf Design. The plan is located on the Club Documents page. Kinsale Golf Club has a long and distinguished history and can trace its origins back to 1880. It is situated 5 kilometers from the Historic town of Kinsale and is just over 20 kilometers from Cork City. The course is in a rural setting and has stunning views of the surrounding countryside. It measures 6,935 yards and consists of two nine hole loops finishing at the Clubhouse. The Club has played host to major tournaments including the All Ireland Finals of the Cups & Shields in its Centenary year 2012. The Club has a full range of practice facilities including , 6 bay driving range, putting and chipping greens, Pro Shop and Catering facilities. Attractive Green Fee rates are available, click here for details. Kinsale is the southernmost town on the Wild Atlantic Way. The town is known as the Gourmet Capital Of Ireland with a large selection of restaurants, cafes, bars and hotels to suit every budget. There are many sandy beaches nearby with sailing and fishing well catered for. It is an ideal location for those planning a golfing holiday.